So things are a little crazy around here lately... which might be evident by the large number of posts that are nothing but pictures with a few random words stringing them together. School is wrapping up in the next three weeks, so I am in the mist of final papers, studying for exams, and getting everything in line for graduation (!!! ), plus we have tball three times a week (THAT'S RIGHT) and SOMEONE is on the cusp of turning FIVE FREAKING YEARS OLD so we are birthday planning...Oh, and I am still in the six week recovery window for that hysterectomy, so I am in theory attempting to 'take it easy', whatever that means. (it means nothing beyond avoiding heavy lifting at this point). So... basically this is a disclaimer that this blog will be picture heavy and writing light over the next few weeks. And sometimes (like today) I may throw two different sets of pictures up into one half-thought-out post, just to make sure they all make it into my life scrapbook of a blog. The upside is that I got that fancy new camera, so the pictures are pretty decent (pats self on back). The downside is that you wouldn't have nearly as many of my precious WOOOOORDS to enjoy. (the length of this random introduction may be evidence to the contrary...I love my words). ANYWAY... PICTURES! Over the last two weekends we have had a couple of family gatherings. This past weekend we celebrated Easter at my parent's farm, and then the weekend before that we celebrated SEVEN family member's birthday at my father in laws house. If you are curious, there are like (counting..) fifteen people in this family, so having seven occur in the span of six weeks seems INSANE (but not statistically impossible). Anyway, see below for pictures of both events. We are so lucky to have such an amazing family! 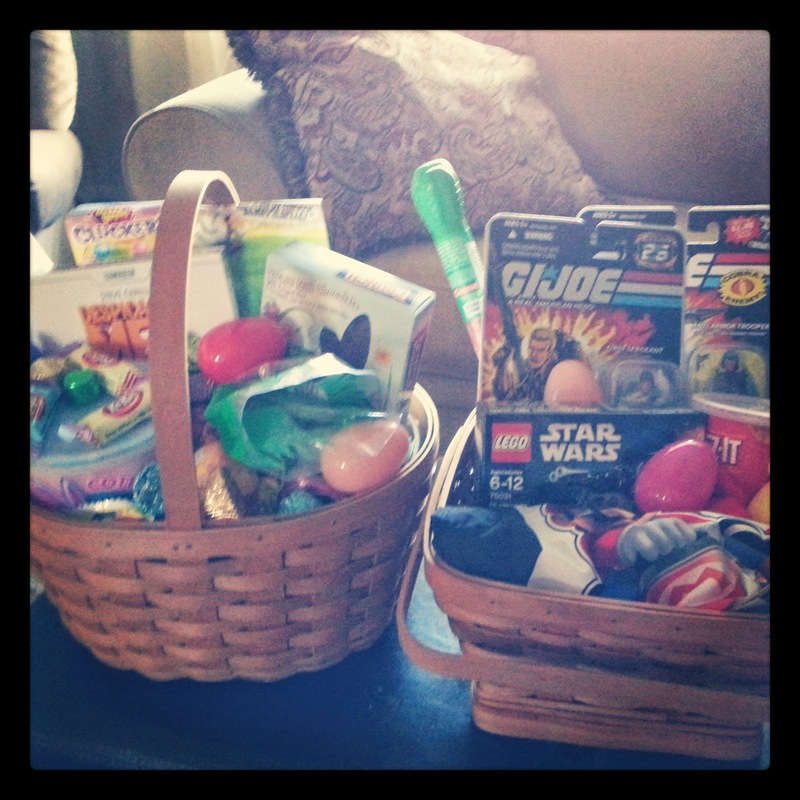 We should maybe start this post with Easter morning... and Henry's double Easter basket. SOMEONE (ME) clearly struggled with the size restriction of his one basket. But can you even blame me?? I could eat him up, I love him so. After baskets we headed over to Grandaddy and Val's for an Easter lunch. Checking out how Henry measures up to Aunt Candice... this will now be an annual picture, and we will see how long it takes him to reach her! Mama playing with her sweet boy. Where two adorable children spent the day being adorable. hunting, sharing. They are so sweet. Wait, I did get these two with my Mamaw! It was an excellent Easter! 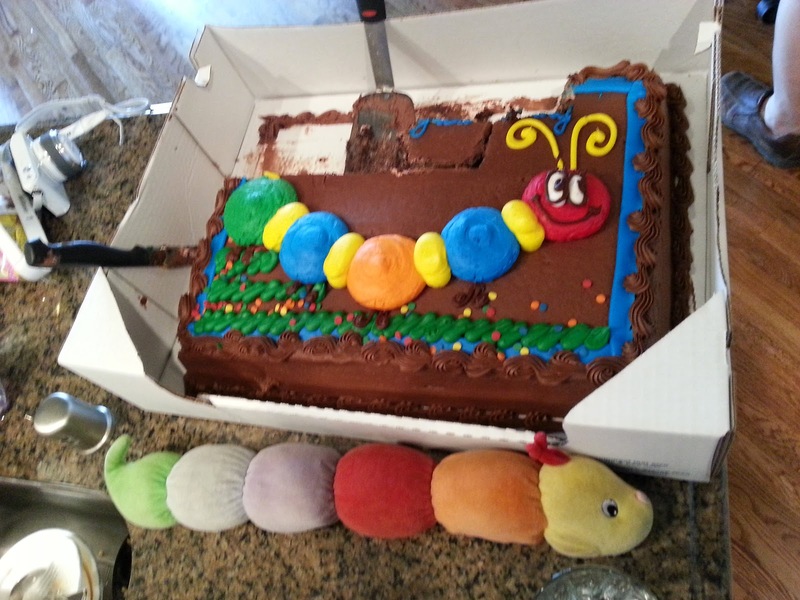 A picture of a half eaten birthday cake! But I think it's so amazingly sweet that even though we were celebrating SEVEN birthdays, Henry was not one of those birthdays. And yet, when Granddaddy went to find a cake, he saw this and thought "PERFECT!!" Henry LOVED it!! Two of the birthdays we were celebrating were Matt and Chris, Val's sons who both happen to be in town from their appointed posts in the Navy. We always love our chances to be with these two guys, and are so proud of them for all they do. Birthday boy, Grandaddy enjoying having the entire family together. Was I on point with capturing people smiling/laughing or what? Birthday girl Nicole being adorable as always. 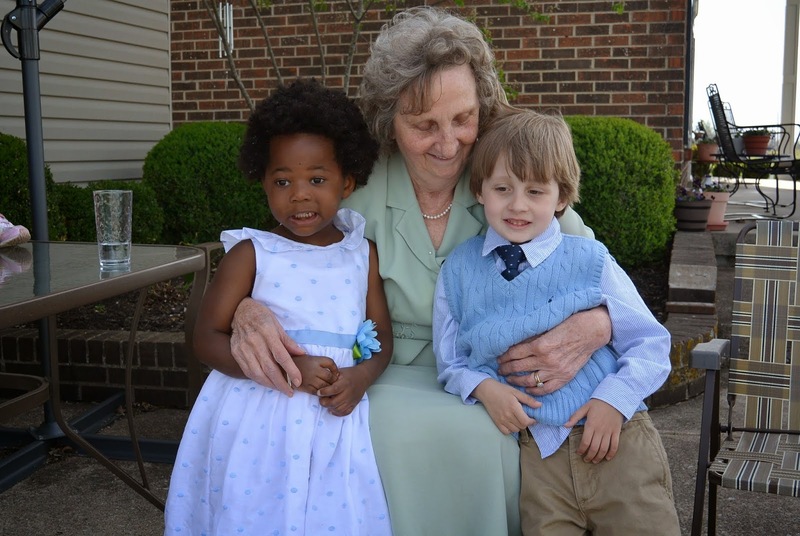 Henry and his great grandma. 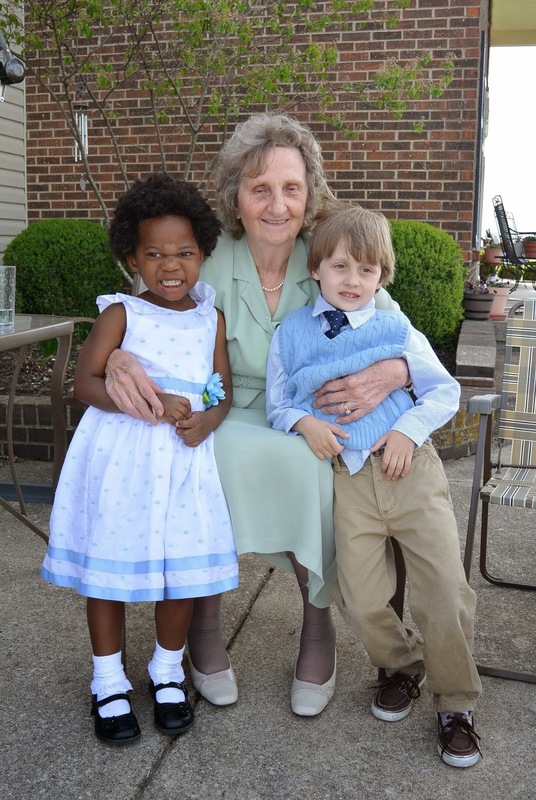 Great Grandma has now moved to Kentucky from Alabama and we are SO HAPPY to have her so much closer! Birthday boy Nick taking a swing at the birthday pinata. Seems safe... especially with that glass door right beside him. It was a great Birthday party, a great Easter, and an amazing last couple of weekends!